Every year I swear I'm going to work at getting better with wire. And every year I learn a bit more, but still end up intimidated by my pliers! Now there is a totally unique book with a brand new take on using wire with beads and cabochons, and I love it. While I also love traditional wire wrapping, I'm not particularly good at it. 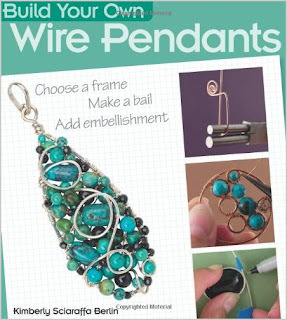 Kimberly Berlin's free form style in Build Your Own Wire Pendants makes me think that just maybe I could actually do this. This just might be the year! Kimberly starts with all the basic techniques that you'll use, which is especially helpful to have all in one place when you begin to design your own pendants. Working through Kimberly's projects will have you making a basic frame, creating embellishments, and learning to mix the techniques to suit your own materials and style. Framed projects are the majority of the book, with 14 projects plus multiple variations. Kimberly then moves on to working with drilled pendants and creating wire bezels. I think of these 6 additional projects as a bonus that will unlock even more possibilities for the frames you've already mastered, but that can also stand on their own. This book looks like it would be right up my alley. I already have this book on my list to buy. I think it sounds great. I have admired Kimberly's work for a while now.